A. What type of cruising will I use the boat for? B. Where will I be doing most of my cruising? C. How many people will usually be aboard? D. Where will I keep my boat when I'm not using it? Answer those honestly, and you're halfway there. The rest of it - finding the right type of boat to meet these key criteria - is largely a process of elimination. We've just spent the last couple of weeks lazing aboard 'Alacazam' at anchor off Ste Anne, Martinique, in the French West Indies. Already there's a healthy growth of vegetation on the length of anchor chain suspended above the seabed. If we leave it there when we recover the anchor we'll be rewarded with a fishy smell pervading the boat for quite a while - more so if the anchor locker drained into the bilge as it does on many boats. We could try to brush it off as we slowly recover the anchor - a tedious process and not very effective. But there is another way which involves less work, which clearly is most likely to appeal to me. How? Well, a couple of days before you're due to up-anchor, let out more chain so that the length with the growth on it is now on the seabed. As the chain is dragged about by the swinging of the boat, the chain will clean itself. We left the St Pierre anchorage at Martinique in calm conditions. Out of the lee of the island the wind picked up to around 15knots out of the east - perfect tradewinds for a full sail reach to our next anchorage at Prince Rupert Bay at the northern end of Dominica, some 55 miles distant. Halfway along the coast of Dominica we decided to drop the hook for the night off the abandoned 'Castaways Hotel'. After a good nights sleep we set off again to complete the remaining 12 miles or so to Prince Rupert Bay at Portsmouth. In overcast conditions and light southerly winds and a following sea we were under power. Ominous black clouds were building to windward. About 3 miles short of our destination a westerly wind picked up, blowing at around 15 to 20 knots - unusual, but not unheard of. Not ideal though, as it meant that we would be anchoring in choppy waters off a lee shore. We found a suitable spot in 9.5m and Mary swung the boat around into the wind whilst I went forward to drop the hook. No sooner had the anchor hit the water when the squall hit us - torrential rain and 35 to 40 knots of wind. Being fairly light, 'Alacazam' was being blown downwind pretty quickly. I let out 45m of 10mm chain as fast as I could, very much aware of the large Oyster that was anchored directly downwind of us. Our anchor, a 20kg ROCNA was going to have to bite first time, or we - and the Oyster - were in a spot of bother. And bite it did, pulling us up with a most satisfying jerk leaving us well clear of the Oyster. I'll never regret having invested in the ROCNA, it had once again proved its worth. After around 30 minutes of high winds and breaking seas, the squall passed through leaving us with a 20 knot westerly and impressive seas breaking rather threateningly on the shore. These conditions stayed with us for the next 12 hours before calming back down to 'normal'. Not much sleep was had by anyone that night, but the weather event was quite widespread throughout this part of the Caribbean. One yacht was wrecked on the shore at St Pierre, the anchorage we'd left the previous day. It's not all sunshine, white fluffy clouds and wall-to-wall sunshine out here in the West Indies - even paradise has its off days! My pal John - he of s/y Petronella fame - and I were sitting in Alacazam's cockpit supping a cold beer apiece and discussing the merits of onboard wifi. I was singing the praises of my system, one developed by Bitstorm Inc comprising a 'Badboy Extreme' wifi antenna/enhancer and an 'Unleashed' wifi router. "How much did that set you back?" asked John. "The thick end of $500", I replied. "I've got one I cobbled together myself for less than $60 that works fine" said John. "How about writing a 'how to' article for my newsletter?" I said. "Imagine you are sitting in an anchorage desperate for an internet connection. It’s a new island to you so your 3G Sim card won’t work. Your PC can see a couple of weak WiFi connections but none is good enough to connect to. You do happen to know the password for the internet café ashore. But for now you are stuck until you go ashore. Or are you? Perhaps with a cheap set up you could get back online. Everyone has their own idea of how to connect in these circumstances. This is how we do it on Petronella. An Alfa AWUS036H WiFi booster (1) with extra long aerial (2) plugs into a USB extension lead (3) which in turn plugs into the USB port of our Windows 8.1 PC. 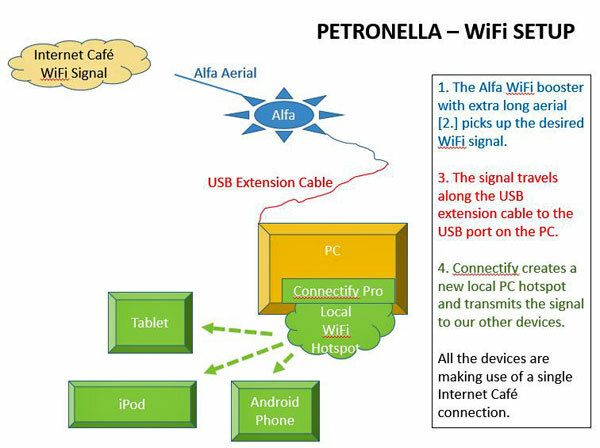 Connectify Pro (4) makes the PC into a local Petronella WiFi hotspot that then allows other devices to connect to it. Too difficult? Here’s a picture of the basic setup. How to set it up 1. Buy the bits (see links at the end of the article). 2. Join them together. 3. Plug the USB extender cable into the PC. 4. Choose the internet cafe WiFi signal from the Network Connection icon. You should now be using the boosted signal to connect your PC to the Internet Café’s network. Now to extend things so that your other devices can use this same connection. 5. Download Connectify Pro. 6. Start up Connectify Pro using the correct network and generate your own local WiFi hotspot. 7. Connect your other devices to your local WiFi hotspot - and off you go!! This all sounds nice and easy but in practice it does take some time to set it all up. Once it is working though it’s great. I’ve only used this with Windows PCs as the WiFi hotspot host. Make sure you buy a genuine Alfa booster. Don’t let the booster and aerial get wet (we wrap ours completely in 3M blue tape). If your boat is steel make sure the Alfa is outside the steel hull and always point the aerial towards the internet café. Don’t bother with downloading any drivers to start with. Just plug in the Alfa and see if you can see it and the networks it identifies, by clicking on the normal networks icon at the bottom right of the screen. It is possible to set up the PC to be a WiFi hotspot without using Connectify or any other software package. But I found it easier to use the Connectify user interface. Otherwise it is all done via DOS commands! Make sure that even though you are connecting to the Internet Café via one of the Alfa connections, you do not disable the original WiFi adapter. You can see this by clicking on the networks icon again." Thanks very much for that, John. One question though - Why didn't you tell me about it before I spent $500? In an earlier issue of 'The Sailboat Cruiser', I mentioned the setting up of this new facility on Sailboat-Cruising.com. Since being back out in these parts I've been doing more research and have found a total of some 730 companies and individuals that provide services for cruising sailors. The directory is in its infancy at the moment with entries giving just a name and phone number. Within the next few months I'll invite each service provider to enter their full details (address, email contact, website, description of services available etc) along the lines of the enhanced listing of Power Boats, Trinidad. 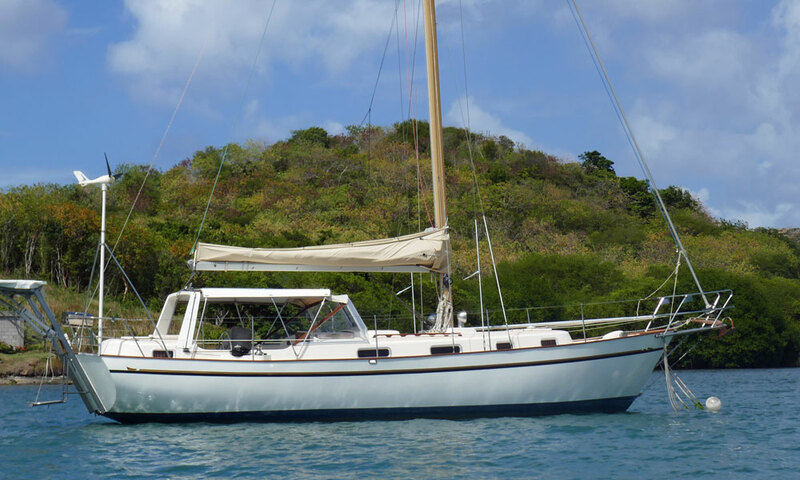 Anyone recognise this cutter-rigged ketch? It's always worth taking a look at what visitors to sailboat-cruisng.com are getting rid of. Remember one man's junk is another man's gold!